Woo hoo!! So glad you are feeling better and I'm SO impressed with your nursery planning/shopping. Can't WAIT to see this nursery...going to be darn amazing I know!! Yay! So glad you're feeling better. And love your little bump. In a month or so you'll be writing something like "it seems like my belly popped out over night!". So excited for you! You look great! I can't wait to see afull blown belly!! I love the outlets-but I never really find anything at PB. We will get together soon-lemme get thru this bday party madness, etc. I wonder if they didn't have cribs due to the ban on selling/giving away drop down cribs. Sorry you didn't have better luck. Yay for a baby bump and feeling better - wooHOO!! 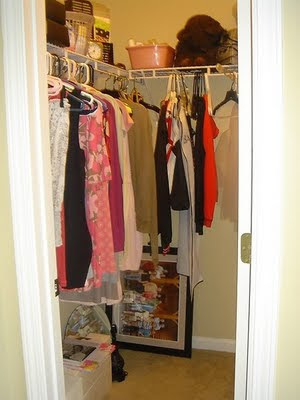 And I love the idea of an orange closet. Our girls' bathroom is neon green. Yep. I wanted something bright and beachy - we have a lot of artwork from our mission trips to the Dominican Republic plus our favorite travel spot - Destin - so it just made sense. :) Go with what makes you happy, I always say.